CHO Posts recruitment 2019. Candidates will be selected based on candidates merit in BAMS Final Year marks only. A short list will be called for based on BAMS for these Community Health Officer posts. Last date to submission of application form to NHM Maharashtra CHO Posts is 23-02-2019. Selected candidates initially posted in any government hospital for six months. Later candidates have to appear for exit exam. Exit Exam cleared candidates will be posted as Community Health Officer CHO in their respective area. 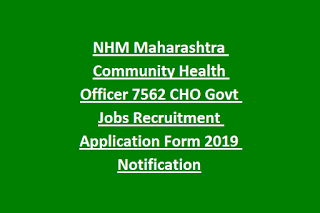 More information regarding this NHM Maharashtra Community Health Officer Recruitment is updated below. 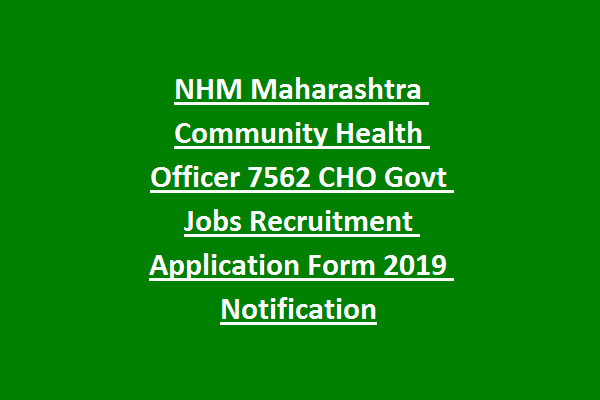 There are total 7562 CHO Posts in this Maharashtra recruitment of National Health Mission. Upper age limit is 38 years for Open Category candidates. For reserved candidates age limits are 43 years. BAMS qualified candidates are only eligible for this CHO posts. Based on candidates BAMS final year exam marks a short list will be prepared on district level. Those candidates only called for documents verification for this National Health Mission CHO Posts. Candidates initially posted in any one of the government hospital for 6 Months. After 6 months candidates have to write the exit exam. Then candidates will be posted in his or her nearest area. Candidates must visit the 10 houses per day. Application form is available to download at https://www.nrhm.maharashtra.gov.in. Last date to reach the application form to respective “District Health Officer, Zila Parishad………………………” before the closing date of 23-02-2019.